This composite image shows the distribution of dark matter, galaxies, and hot gas in the core of the merging galaxy cluster Abell 520, formed from a violent collision of massive galaxy clusters. Starlight from galaxies is indicated in orange. Green indicates hot gas, and blue indicates mass, most of which is dark matter. 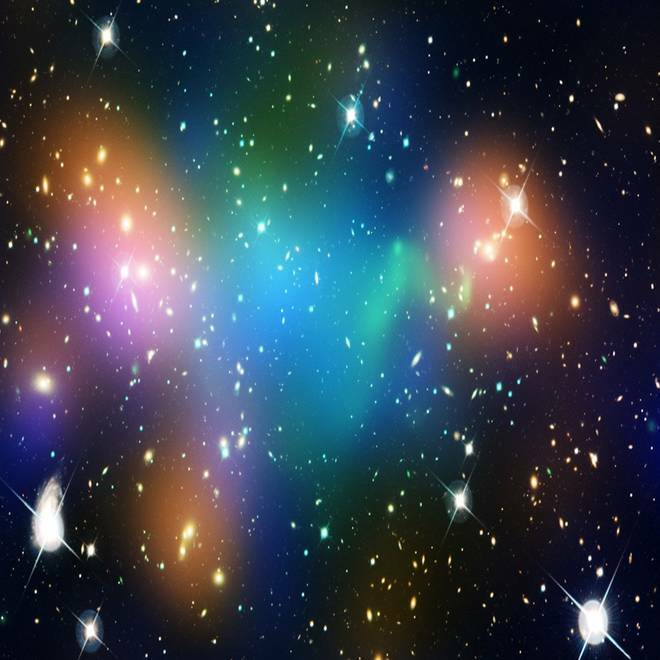 Astronomers using the Hubble Space Telescope are mystified by a merging galaxy cluster known as Abell 520 in which concentrations of visible matter and dark matter have apparently come unglued. A report on the Hubble observations, published in the Astrophysical Journal, raises more questions than answers about a cosmic pile-up that's occurring 2.4 billion light-years away. "We were not expecting this," the study team's senior theorist, Arif Babul of the University of Victoria, said in a news release. "According to our current theory, galaxies and dark matter are expected to stay together, even through a collision. But that's not what's happening in Abell 520. Here, the dark matter appears to have pooled to form the dark core, but most of the associated galaxies seem to have moved on." The dark core was first detected in 2007 during a survey aimed at measuring the masses of 50 galaxy clusters using data from the Canada-France-Hawaii Telescope at Mauna Kea in Hawaii. The discovery presented the perfect opportunity to map the distribution of visible vs. dark matter in the cosmic mess. Studies have shown that we can see only about 15 percent of the matter in the universe. Most of the matter that exists around us can't be seen directly, but can be detected only by its gravitational effect. Scientists don't know what dark matter is, but they suspect it's an exotic class of subatomic particles that can interact only weakly with the kinds of matter we can see. Dark matter is thought to provide the invisible "scaffolding" for structure in the universe, gravitationally binding galaxy clusters into a cosmic web. Those clusters get so massive that they bend the light of distant galaxies like a lens. By analyzing those subtle deflections of light, it's possible to come up with a map showing where the dark matter lies. That's what astronomers did with Abell 520 — first with the telescope in Hawaii, and then with the Hubble Space Telescope's Wide Field Planetary Camera 2. The results contradict what scientists thought they knew about dark matter. In a previous study of the Bullet Cluster, 3 billion light-years from Earth, astronomers found that concentrations of dark matter blasted through the scene of a collision, with their associated galaxies tagging along. Meanwhile, waves of hot, X-ray-emitting gas clumped up in the middle. In the case of Abell 520, the situation is completely different: The galaxies sailed through the collision, but the dark matter piled up in the middle, along with the hot gas. Researchers were hoping that Hubble would resolve the mystery first posed by the detection of the dark core in 2007. No such luck. "We know of maybe six examples of high-speed galaxy cluster collisions where the dark matter has been mapped. But the Bullet Cluster and Abell 520 are the two that show the clearest evidence of recent mergers, and they are inconsistent with each other," James Jee, an astronomer at the University of California at Davis who is the lead author of the Astrophysical Journal paper, said in a news release from the Space Telescope Science Institute. "No single theory explains the different behavior of dark matter in those two collisions. We need more examples." Jee, Babul and their colleagues propose several possible explanations for the discrepancy. One explanation might be that the dynamics of the Abell 520 collision are more complex than the Bullet Cluster's crash. Maybe multiple collisions, involving three or four galaxy clusters, have led to the dark matter pile-up. Another possibility is that there's actually lots of ordinary galactic material in the core, but it's just too dim to be seen, even by Hubble. That would suggest that the super-dim galaxies in the core have somehow formed far fewer stars than normal galaxies. The most unsettling scenario proposes that there are different kinds of dark matter, and some of those kinds are "stickier" than others. Abell 520 might have a particularly sticky kind of dark matter that interacts with itself and clumps up like a wet snowball. The astronomers behind the Abell 520 observations are now planning to run computer simulations of cluster crashes to find out whether there's an unusual set of conditions that could produce those observations and still fit current theory. "My colleagues tell me the likelihood is nil," Andisheh Mahdavi, a member of the study team from San Francisco State University, said in a news release, "but now we have the responsibility to go and do the hard work to check the simulations." If the simulations aren't successful, the mystery might have to be left for particle physicists to mull over. Some hope that experiments such as Europe's Large Hadron Collider and the Alpha Magnetic Spectrometer, installed last year on the International Space Station, will eventually shed additional light on the dark matter mystery. "I'm just as perplexed as I was back in 2007," Mahdavi said. "It's a pretty disturbing observation to have out there." Update for 5:40 p.m. ET March 2: The picture of Abell 520 served as this week's "Where in the Cosmos" picture puzzle on the Cosmic Log Facebook page this morning, and it took only a few minutes for Ryan Marquis to figure out what the image was all about. "It appears the dark matter and galaxies aren't anchored as previously believed," he wrote. I'm sending Ryan a pair of 3-D glasses as a token of my appreciation. It turns out Ryan's a fellow space blogger who posts his items on 46BLYZ. We're glad to have him as a Cosmic Log correspondent, and hope that more of you will join our Facebook community. That's where you'll find the next "Where in the Cosmos" puzzle, a week from now. Correction for 9 p.m. ET March 5: The original version of this item had the wrong first name for SFSU's Andisheh Mahdavi. I regret the error and extend apologies to the professor. ... And what about dark energy? In addition to Jee, Mahdavi and Babul, the authors of "A Study of the Dark Core in A520 With Hubble Space Telescope: The Mystery Deepens" include H. Hoekstra, J.J. Dalanton, P. Carroll and P. Capak.